Name: Chili and Cinnamon Roll Lunch Fundraiser to Benefit Alzheimer's Assoc. 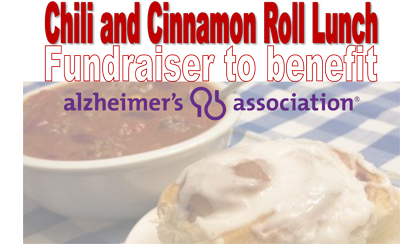 Chili and Cinnamon Roll Lunch Fundraiser to Benefit Alzheimer's Association. Meal includes: Chili, cinnamon rolls and crackers. Dine-in or pick-up.